Social media is the latest target for almost every digital marketing initiative; however, most users often feel claustrophobic when overwhelmed with meaningless clutter of content and media. Social media initiatives celebrate the personalized approach of creating valuable connect with the target audience, building trust with them and resonating your brand’s values within them. But with every brand following this golden route, what benefits can your organization reap from social media’s ocean of opportunities? 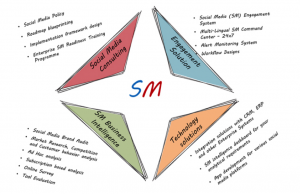 Social Media Strategy: A comprehensive social media strategy is derived by analyzing business objectives of the organizations and the organization-specific need for social media marketing. The scope of the overall approach is then defined based on the size, behavior, and likes and dislikes of the target audience; possible social media opportunities and channels; the desired outcome; and the type of content that will engage with the audience. Blueprint Roadmap: The final roadmap of the campaign strategy is reviewed in detail before launch to ensure that the approach matches the objectives. Identify metrics that are accurate indicators of social media campaign performance. Develop audit templates for consistent brand performance metrics assessment and link measurable key performance indicators (KPIs) with effectiveness of campaign and achievement of business objectives. Implementation of the Designed Framework: A scalable framework that is customizable across brands is an ideal option to implement social media strategies. The key is to work out all the intricate details from drafting the engagement framework and planning specific processes to defining performance evaluation procedures, planning crisis management approaches, and mapping social media intelligence and analytic requirements to specific campaigns. Regular workflow workshops ensure that every stakeholder delivers a consistent performance throughout the campaign. Training: Regular training of stakeholders right from finalization of content strategy standardizes the process details of the approach, facilitates a high quality of performance, enables tool orientation, and builds social media policy awareness. Social Media Insight and Analysis: Detailed analysis of the voluminous data generated from engaging with the audience and generation of in-depth insights helps in evaluating customer feedback, brand proficiency, product development proficiency and quality of consumer-generated media. Data insights and analysis services provide customers crucial business intelligence to optimize the target audience’s experience. Brand Proficiency: Brand proficiency is a measure of the brand’s relevance in the market and the influence of social media campaigns on the brand’s value. Every marketing strategy aimed at getting the brand closer to the target audience creates a deep impact in their minds about the relevance of the brand. Hence, lackluster or cluttered approaches would do more damage than gain – especially social media strategies, since these spread like wildfire. Hence a careful approach toward building brand proficiency is crucial, from brand audit, brand image assessment, and evaluation of existing approaches (including websites) to appraisal of the influence of the latest strategies, events and viral campaigns. Product Positioning: The crucial aspect of product positioning is to identify where the brand ranks when compared to competition and to determine the current perception of the target audience regarding the brand. A gap analysis and customer expectation analysis complete the initial work required to define the product positioning. These steps help define the value the brand would deliver to its target audience as compared to its competitors and the differentiator that would make it stand out in the market. Consumer-Generated Media (CGM) Insights: CGM is an integral aspect of most social media strategies, given their ability to drive intense brand engagement and the legitimacy of the consumer’s recommendation of a brand. Consumers are indeed the most loyal of brand representatives and their words do carry a lot of weightage. Deriving data insights (through segment analysis, influencer analysis, and product sentiment analysis) to assess the effectiveness of CGM is hence crucial. Customer Feedback: Customer feedback is as important as CGM insights in assessing the direction of social media campaigns. These feedbacks could usually originate from poor product experience. Hence, it pays to track the cause, determine what went wrong, and resolve the situation immediately to salvage the situation. It also pays to assess the impact of the feedback on the campaign. Engagement Solution: A readily deployable engagement framework that is customizable for specific organizational requirements and scalable across geographies represents an ideal engagement solution. The first step to building the framework is through brand audits, which help develop a response or engagement strategy. Designing a response blueprint helps finalize the framework by developing a workflow design, response rulebook, and response scripts. Social Media Engagement System for Brands: The entire social media engagement package for brands encompasses all the intricate details of marketing and promotion, micro-scheduling, getting all the basics right to achieve Customer Service 2.0 (it’s all about exceeding your target audience’s expectations) and exhaustive social CRM. Social Media Engagement System for Products: In terms of product management essentials, social media campaigns must plan for online reputation management, leveraging Research 2.0 options (futuristic technologies that enable in-depth and continuous engagement with target audience), assessing public relations and human resources, highlighting corporate social responsibility, and achieving Office 2.0. Technology Solutions: Multiple custom social media technology solutions are available to effectively manage complex campaigns. These range from integrated platforms leveraging the benefits of CRM, ERP and other enterprise systems to customized social media intelligence dashboard development and application development for social media platforms. Organizations should carefully assess their objectives against the benefits of these solutions to choose the ideal option.